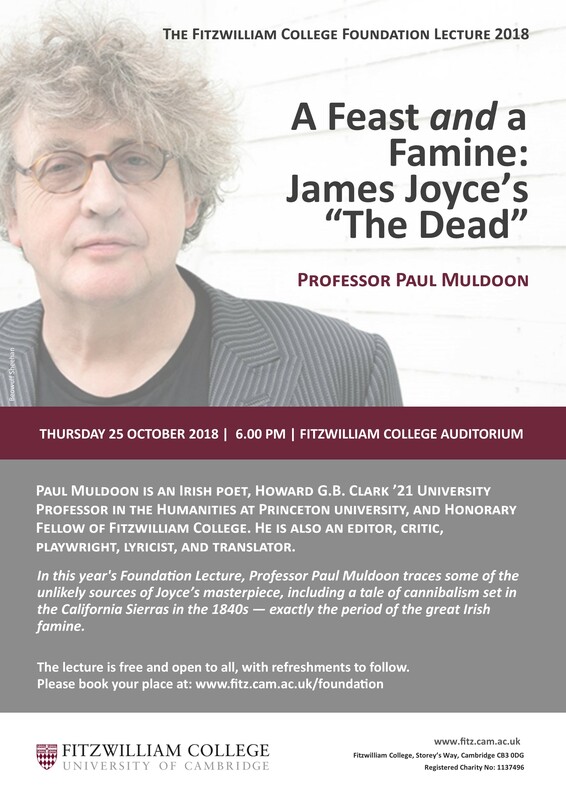 In this year's Foundation Lecture, Professor Paul Muldoon traces some of the unlikely sources of Joyce’s masterpiece, including a tale of cannibalism set in the California Sierras in the 1840s — exactly the period of the great Irish famine. Bookings now open - book your free place here. ​​Paul Muldoon is an Irish poet and professor of poetry, as well as an editor, critic, playwright, lyricist and translator. Born in 1951 in Portadown, Co. Armagh, Northern Ireland, to Patrick Muldoon, a farm labourer and market gardener, and Brigid Regan, a schoolteacher, Paul Muldoon was brought up near a village called The Moy on the border of Counties Armagh and Tyrone. He is the oldest of three children. After studying at Queen’s University, Belfast, he published his first book, New Weather (Faber) in 1973, at the age of 21. From 1973 he worked as a producer for the BBC in Belfast until, in the mid-1980s, he gave up his job to become a freelance writer and moved to the United States with his second wife, the American novelist Jean Hanff Korelitz. He now lives in New York City and Sharon Springs, New York. He is the father of two children.